Windows 8 has been described by Microsoft as its ‘boldest’ Windows release ever and the 8.1 update enhances the paradigm further. Beginning Windows 8.1 takes you through the new features and helps you get more out of the familiar to reveal the fullest possibilities for this amazing new operating system. You will learn, with non-technical language used throughout, how to get up and running in the new Windows interface, minimize downtime, maximize productivity, and harness the features you never knew existed to take control of your computer and enjoy the peace of mind and excitement that comes with it. 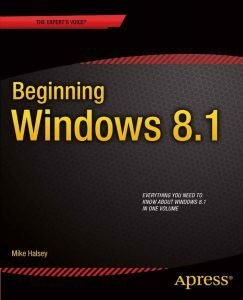 From tips and tweaks to easy-to-follow guides and detailed descriptions, this book takes you inside Windows 8.1 to discover the true power and flexibility that lies within, and guides you at your own pace through getting the very best from it.